'American Horror Story: Hotel' Spooky Fan Wedding Just Add Pepper! The world's biggest 'American Horror Story' fans tied the knot Saturday night with a themed wedding fit for a Supreme. Michael Scola and Jordan Rodarte's 1920's-style bash was inspired by season 5 -- 'AHS: Hotel' -- and the couple nailed every detail from the cardboard cutouts of the cast ... plus an actual cast member. 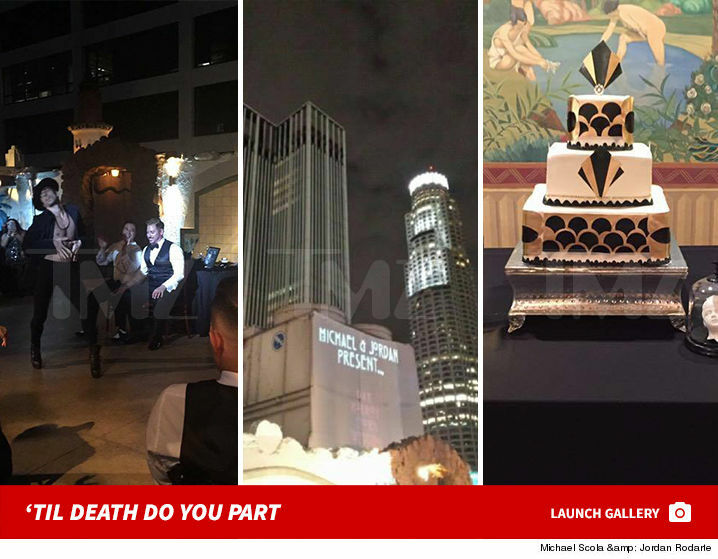 The ceremony went down at L.A.'s Oviatt Penthouse, used for the show's fictional Hotel Cortez. For extra spookiness ... the reception was held at Millennium Biltmore Hotel which, according to legend, is riddled with ghosts including the Black Dahlia who had her last drink there. The coolest part ... guests went nuts when Pepper -- played by Naomi Grossman -- strolled down the aisle in full costume and presented the couple their rings. Ryan Murphy ... give these guys a cameo STAT.